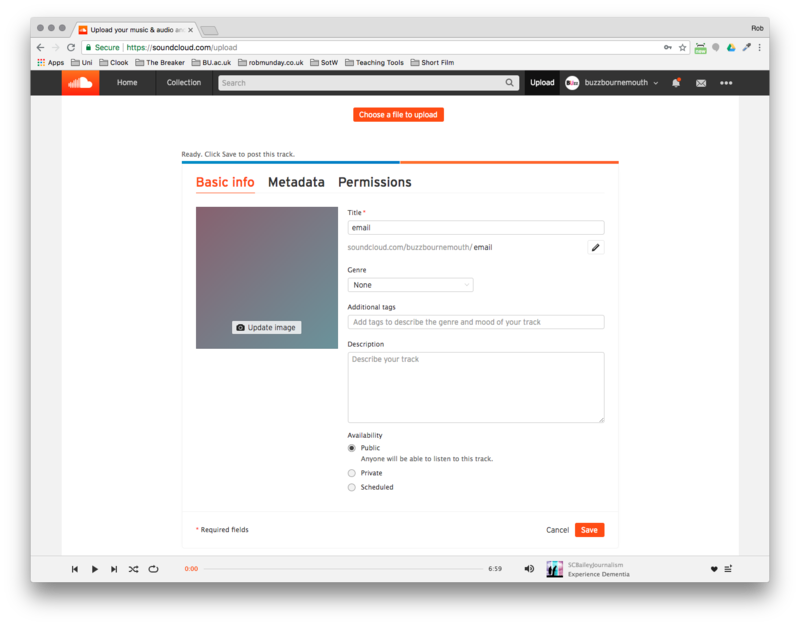 Although it is possible to upload audio directly to WordPress, we advise uploading to Soundcloud and then embedding the audio within your story – this way Soundcloud handles all the encoding for you and you will have a portfolio of all your audio in one place. 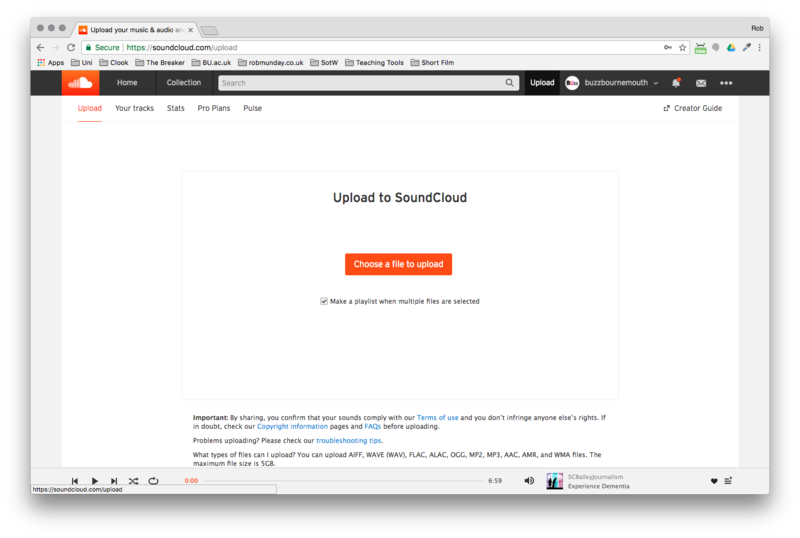 Soundcloud provides the perfect platform to easily record and upload audio. 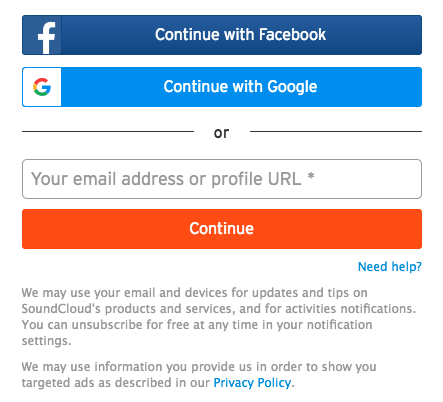 By creating an account at www.soundcloud.com you can not only upload audio tracks and embed them in Posts on the your website, but also create a portfolio of recordings that can easily be shared through social media and other services. 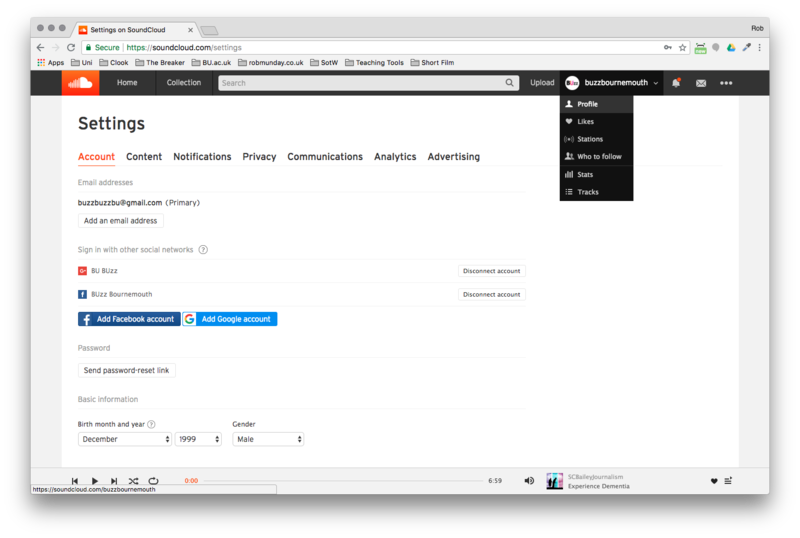 To configure your Profile on Soundcloud click on your username in the menu at the top of screen and select ‘Profile’ from the drop-down. On this page if you click on the ‘Edit’ button you can configure your Display name & Profile link, upload a Profile image and enter a bio. To begin adding audio to your account, click on the Upload button in the menu bar at the top of the screen. 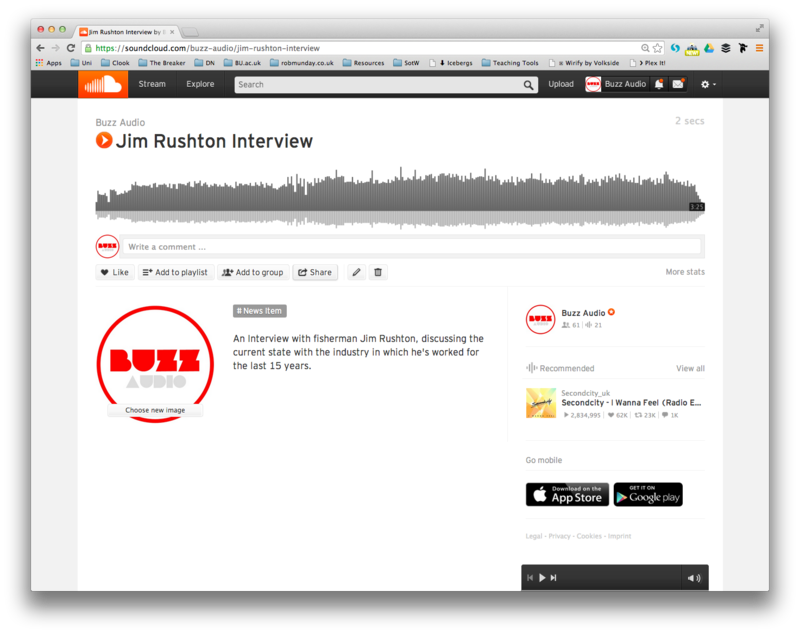 Click on the ‘Choose a file to upload’ button and add the audio you want to upload. Soundcloud will accept AIFF, WAVE, FLAC, OGG, MP2, MP3, AAC, AMR and WMA files. The maximum file size is 5GB. 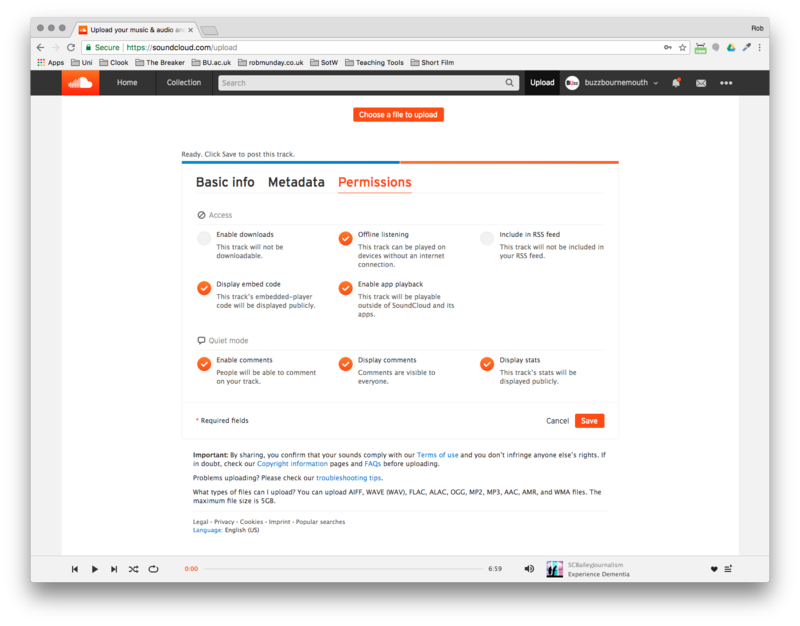 If you click on the Permissions tab, you can control whether Soundcloud members can comment on your audio, whether it can embedded and more. Click on the Save button once you have added all the necessary information to your file. Now your file has been uploaded, you can embed it into a Post on your website – to begin Click on the Share button. 1. 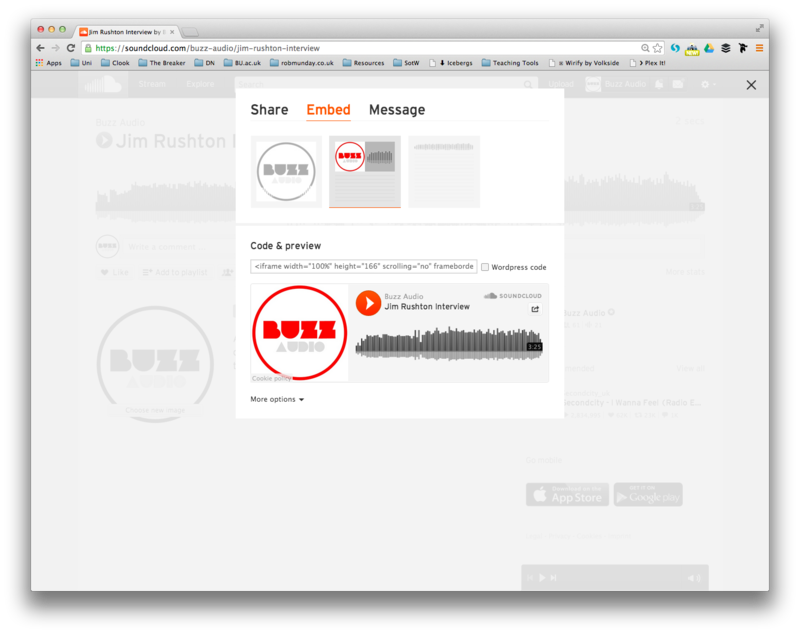 From the Share tab copy the URL for your Soundcloud track (this should be pasted into the Visual Editor of your post).